PARIS — Negotiations to resolve signal overlaps between European and Chinese satellite navigation systems have made no progress despite more than two years of effort and the issue now poses “a major problem for the security of the EU,” the European Commission says. “[A] solution will not be found without political support” from top European authorities and from the European Parliament, according to the commission, which is the executive arm of the 27-nation European Union (EU). In a Jan. 18 update on Europe’s Galileo satellite navigation system, the commission suggests that efforts to persuade China to move away from frequencies planned for Galileo’s Public Regulated Service (PRS) have gone nowhere. PRS is Galileo’s equivalent to the U.S. GPS military code, which is encrypted and reserved for defense and security customers. China is under no legal or regulatory obligation to steer clear of PRS for its Compass/Beidou navigation system, now being deployed, because a signal overlap will not prevent users of either system from accessing their services. But the overlap will make it impossible for China or Europe to jam one another’s signals without disabling their own service. This is an issue the United States and Europe spent several years negotiating before European authorities agreed to place PRS on a radio frequency some distance from the GPS military code. The commission’s report says Galileo is in a competitive race with Russian and Chinese navigation constellations to be the global complement to GPS and is at risk of losing the race because of Galileo delays that likely will mean full service is not available before 2020. The Russian Glonass and Chinese Compass/Beidou efforts have been given priority by their government sponsors. 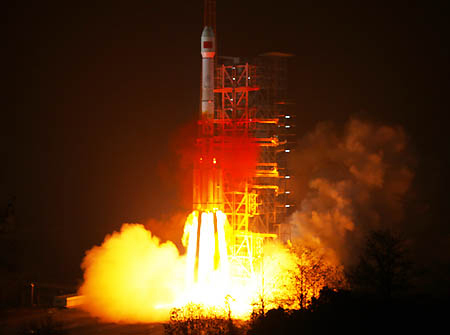 Glonass is now expected to return to full global service by 2012, with Compass/Beidou following perhaps two or three years later. These services, plus regional systems being built by Japan and India, and the established GPS system, “provide a challenge … in competitive terms,” the commission says. Already the presence of GPS as a global utility free of user fees has forced Galileo managers to scrap former ideas of generating lots of revenue from Galileo’s commercial service. In the report, the commission says it has abandoned ideas of imposing a royalty fee on navigation chipsets, and of charging commercial airlines for use of the safety-of-life feature on a Galileo overlay feature called Egnos. No fees will be imposed for use of the safety-of-life service on Galileo either, the commission says, noting that GPS users get it free of charge. In addition to causing Europe to fall into third- or fourth-place position among navigation terminal builders worldwide, service delays will reduce the economic benefits expected of Galileo, the commission says. Each year’s delay of full service availability “will decrease the value of the benefits by 10-15 percent owing to both the loss of revenue generated and the development of alternative solutions and competing systems,” the commission says.